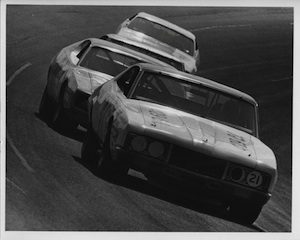 Forty years ago this month, one of the great pairings in the history of NASCAR hit the track for the first time. 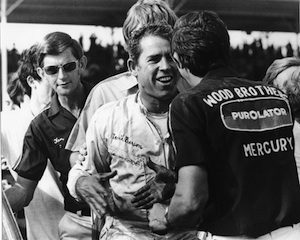 It was at Darlington Raceway, on April 16, 1972, that David Pearson first drove a car for the Wood Brothers race team. 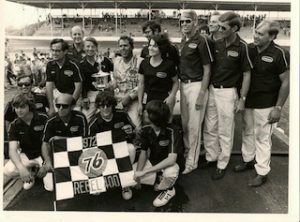 Pearson, who hadn’t won a race in NASCAR’s premier division in more than a year and hadn’t won on a superspeedway in two years, was hired to take over the No. 21 Mercury for A.J. Foyt, who was moving on to concentrate on his Indy Car racing. Some in the sport at that time speculated that Pearson, then 37, was past his prime after winning 60 races and three championships. He’d only won three races in the previous two years combined, and his average finish in 1971 was just 18.9. But Crew Chief Leonard Wood and the Wood Brothers believed otherwise. Pearson had similar thoughts about the Woods, and it turned out that both parties were right. While some driver-crew combinations take weeks or months for the chemistry to click, Pearson and the Woods hit it off from the start of practice that week at Darlington. During their first practice session together, Wood soon discovered that one of the things that others had told him about Pearson was indeed true. The word was that Pearson would never show his hand in practice but still assure his team that the speed was there. He’d run hard on one corner on one lap, then run the other side of the track on another lap, learning what he needed to know without ever running hard all the way around the track until it counted. When practice was done, Pearson told the Woods not to worry. “Sure enough, after practice he told us: ‘I might run a little quicker when I qualify,’” Wood said. When qualifying was done, Pearson had the No. 21 Mercury on the pole with a lap at 148.209 miles per hour. He would go on to win 50 more poles driving for the Woods. That Rebel 400 also launched a renewed rivalry between Pearson and Richard Petty. A hungry Pearson had put Petty behind him when Petty had to make a couple of unscheduled pit stops. Leonard Wood remembers that Petty knew he was in for a battle. “Richard made the comment that he knew David wasn’t going to back off,” he said. Wood said he was amazed at how easily Pearson handled tough tracks like Darlington and at how simple it was to set up a car for him. Wood recalled that while some drivers left him with an uneasy feeling as they ran Darlington, Pearson made it look smooth. While many of his competitors were flirting with a Darlington Stripe off of Turn Four, Pearson usually wasn’t. Wood said. “He brought it off earlier and dropped down low three-fourths of the way through the turn and ran it straight out of there. Pearson parlayed those Darlington skills into his 61st Cup victory and the first of 43 that he would win with the Woods. He also prevailed in a 1-2 finish with Petty. From 1963 to 1977, Pearson and Petty finished 1-2 on 63 occasions with Pearson holding a 33-30 edge. Leonard Wood said those days with Pearson were as good as it gets in racing.